Because our planned guest for 29th December fell through, there will be no competition this month. A few months ago I wrote on this blog about an ending for me – finishing my life as a civil servant. Since then I've had another ending – and, excitingly, a new beginning – because I've moved from London to Brighton. I’ve lived in London all my adult life and in Crystal Palace for nearly fourteen years. It has been a wonderful place to live. I’ve always loved its history and the sense of community and shared identity that brings, and I’ll miss it very much. Crystal Palace wasn’t always known as such. But after the success of the Great Exhibition in 1851 it was decided to rebuild Joseph Paxton’s masterpiece on a permanent site, and run it as a commercial enterprise. A commanding position on top of a ridge in south London on the borders of Upper Norwood, Penge and Sydenham was chosen, the Palace rebuilt and a new identity forged. It became the defining feature of the area, bringing millions of people to visit and live over the next 80 years and changing it forever. Two train stations were built to manage the influx of visitors. Many of the bus routes in south London end in Crystal Palace even now because of the number of people who wanted to get to the attraction. And, as across London, huge numbers of houses were built, but in this case many of them were large and beautiful villas for the well-to-do, wanting to live in this now-fashionable spot. 1) The Dinosaurs. I’ve written about them before, but I make no bones (boom boom) about doing so again. Declaring an Interest, I’m now on the Board of the charity that works to promote and conserve the Crystal Palace Dinosaurs (most of which aren’t actually Dinosaurs, but hey…) They were built in the 1850s as an attraction in the grounds of Crystal Palace and were the first ever life sized sculptures of dinosaurs (and other extinct creatures) anywhere in the world. The sculptures were created at the dawn of dinosaur palaeontology, taking into account the cutting-edge science of the day. We obviously know much more now, so many of them look weird and ‘wrong’ to our eyes. From the point of view of the history of science, therefore, they are a testament to how our knowledge changes and grows with each generation. For the general viewer today, their ‘wrongness’ adds to their charm. 2) The Subway. This gorgeous subterranean space isn’t often open to the public, although the Friends of the Subway are doing an amazing job to provide occasional access days. One of the last remnants of the Crystal Palace and its associated infrastructure, the subway was the passageway between the ‘high level’ train station and the great Crystal Palace itself. The red-and-white patterned space is all that remains of the high level station, but gives an impression of the grandeur and excitement of a visit to one of the greatest spectacles of the age. So, what to take to Brighton as part of my ever-expanding Cabinet of Curiosities? Well, the Ruling History Girl wasn’t very impressed a few months ago when I tried to bring a life-sized sculpture of a naked man into the Cabinet (apparently he wouldn’t fit) so I don’t suppose I can get away with a life-sized Dinosaur either. And I wouldn’t want to take them out of their natural habitat, even virtually. In designing the Dinosaurs, smaller maquettes were made, about 1/8th size of the final pieces. None of them survive, to our knowledge. But if they did, maybe I could fit one of those into the Cabinet? I've recently seen it said that ‘before the Second World War, women didn’t work outside the home.' Nonsense. My maternal grandmother, like all the women in my family, always worked. For one reason or another, they had to. My maternal grandmother started work at ten and just carried on. She might have changed her job when the war started, if there was an opportunity for better wages, but she didn’t suddenly decide to go out to work 'to do her bit.' Children had to learn to cope being on their own — and doing a lot of household chores — at a young age. It was a rackety household. My mother often told me that she never knew who was going to be in the house when she got up in the morning. Her brothers and sisters brought their friends home all the time and the kitchen might be crowded with people drinking tea and eating breakfast after coming off a night-shift. She once came down to find a monkey in the kitchen. One of her brothers had won it at the Oldbury Wake (a fair.) As soon as my Grandmother came home, the monkey had to pack its bags. Poor thing. It was Mum’s three older brothers who were supposed to construct their Anderson shelter. The instructions were to dig a hole at least four foot deep (a little over a metre) to put the shelter in, and to pile earth over the roof. My paternal Grandad, George Price did this. He was a keen gardener anyway and used to digging. My aunt, his daughter, tells me that the family spent many nights in the cold, damp shelter, her wearing her siren suit, her mother knitting and her father reading. A miserable, boring experience it was. Nor did my mother's family have black-out curtains. Either nobody in the family could be fashed to organise them, or they had other ideas about what to spend money on. My mother usually came home from school to an empty house because everyone else was at work. She did this from an early age, well before the war began, because she told me of being too small to reach the latch and open the door. She used to stand in the yard and wait until the family cat came home. The cat leaped up, swung on the latch and let itself in. Mum used to tell me how much she resented that cat and its lordly ways. She liked poetry (The Highwayman and Young Lochinvar were her favourites) but her war-time experience left her with a lifelong dislike of the teachers' pets’ choices. When the sirens sounded, children were allowed to run home to their family shelters if they lived close to the school and their parents were at home. My mother’s best friend lived in a house in the same street as the school. Faced with hearing ‘The Fighting Temeraire’ and ‘The Charge of the Light Brigade,’ yet again (with all the actions), my mother got her friend to tell the teacher that they were going to run to the friend’s house. The teacher let them go. What they hadn’t told the teacher was that the friend’s mother and father were both at work, the house was locked up and they had no way of reaching the friend’s shelter in the yard behind it. While the bombs fell and the guns fired from the hills, while shrapnel rained down, pinging off metalwork, they wandered round the streets; and they did this every time there was a raid during school hours. They whiled away the time by studying the gardens and giving them marks out of ten for neatness, productivity or pretty flowers. Whenever the Second World War is mentioned, that’s the image that comes to my mind: two little girls looking over a garden fence and assessing flower displays while bombers fly overhead and guns boom and recoil, boom and recoil on the hill where I live now. I looked up ‘The Fighting Temeraire’ while writing this blog and I think, in Mum's place, I would have risked the bombs too. Susan Price's website is here. 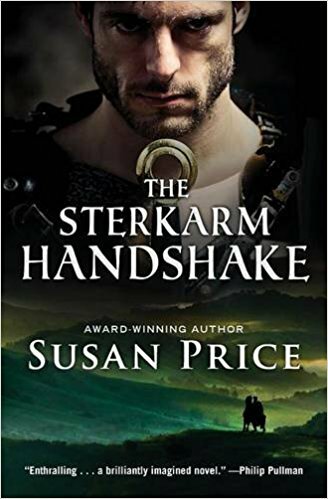 We are grateful to Susan Price for stepping in with this reserve post, as our planned guest for December fell through. Women! Are you suffering from choking, collapse, suffocation, seizures and the inability to speak? Has your doctor ruled out all the usual causes? Have you considered that your womb may have gone wandering in search of moisture? This may come as a surprise to anyone trained in anatomy (or indeed anyone at all in the 21st century) but it would have been a sensible question in the ancient world. Opinion was divided even then, but a substantial number of doctors believed that the womb was not firmly attached to its moorings. It was thus free to roam about the body causing trouble. The doctors of the time were a fiercely competitive bunch who did their best without the aid of microscopes, x-rays or very much sense of scientific method. They were, however, keen observers, and they were confident that neither asthma, epilepsy nor anything else they could name explained the problem afflicting some of their women patients. It became known as hysterical suffocation (from ‘hystera’, a Greek word for ‘uterus’). Luckily there was a relatively safe and straightforward remedy. Wombs were said to be very sensitive to odour. They could be lured by sweet smells and repelled by foul ones. (Smells that they disliked included charred deers’ horn, burned hair or rags, and squashed bed bugs.) Apply the right smells at the right ends of the suffering woman, said the theory, and her troubles would subside as her womb slunk back home. Models of wombs presented to the gods in the hope of healing. If the smells didn’t work there were other options. Few of them can be recommended for trying at home, or indeed anywhere else. Doctor Mantias prescribed drinks of beaver secretions and bitumen in wine, plus flute music and drumming (presumably performed to, not by, the patient). Doctor Asclepiades suggested tight bandaging just below the ribs, making the woman sneeze, shouting at her and blowing vinegar into her nose. If that failed, her helpers could try pouring cold water over her head. Soranus, a specialist whose book on gynaecology still survives, was scathing. “For the uterus,” he declared, “does not issue forth like a wild animal from the lair, delighted by fragrant odours and fleeing bad odours.” He warns that trying to straighten out a woman’s internal tangles by using smith’s bellows to force in air – a ghastly suggestion that seems to have had a long, if surely unhappy, history – would only do more damage. As for the therapeutic effects of loud noises and the prescribed crashing of metal plates – “even many healthy persons have been given headaches by such sounds”. He agreed that the womb was the source of the trouble, but that rather than trespassing in unauthorised places, it was suffering from inflammation. While Soranus and his fellow-medics disagreed on the causes and treatment of hysterical suffocation, they didn’t question its existence. The usual view of modern commentators is that they were describing some sort of stress-related symptoms that we would name and treat very differently today. Before we feel too superior in our modern knowledge, though, it’s worth remembering that when my grandparents were young, smoking was considered to be a harmless way to relax. And by the time surgeons decided that routinely removing parts of healthy five-year-olds wasn’t such a great idea, my innocent tonsils were long gone. Who knows what twenty-first century beliefs future generations will look back on with alarm and incredulity? Hopefully many sufferers were offered the sensible and restrained treatment recommended by Soranus, who suggested laying the afflicted woman down in a warm, bright room, placing warm compresses on her, gently straightening the constricted limbs and washing her face with a sponge. Given such treatment, we can only hope that she would feel well cared-for and that her womb, wherever it had gone, would find its own way home. Ruth writes a series of mysteries featuring Roman military medic Ruso and his British partner Tilla - find out more at www.ruthdownie.com. Once Christmas Day is over, we tend to forget about the small family in a stable in Bethlehem, and what they did next. I’ve been wondering about Mary, and how she coped as a new young mother, in a strange town, with no home or family. We only know what the gospels of Luke and Matthew chose to write about the birth and first weeks of Jesus' life. Matthew tells us that Mary was a virgin, but Joseph her ‘espoused’ learned that she was pregnant, and not by him. An angel told him not to worry, because ‘that which is conceived in her is of the Holy Ghost.’ So he agreed to marry her, and Jesus was born in Bethlehem. That’s all he has to say about the Nativity. 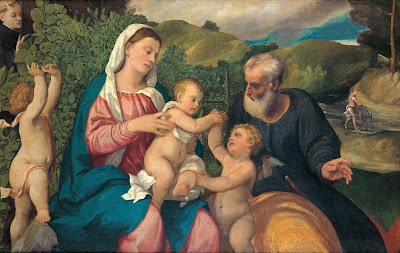 The Flight into Egypt by Battista Dossi and Dosso Dossi, c.1530, with two donkeys! Luke gives much more detail. Joseph and Mary had to travel to Bethlehem for a Roman taxation census. While in Bethlehem, Mary ‘brought forth her firstborn son, and wrapped him in swaddling clothes, and laid him in a manger; because there was no room in the inn.’ Shepherds and wise men came to worship him, and when Jesus was eight days old he was circumcised according to Jewish law. Meanwhile Mary stayed indoors for 40 days until ‘the days of her purification according to the law of Moses were accomplished.’ Then they went to Jerusalem on their way north, where they offered a sacrifice of two turtledoves. After that Jesus ‘grew and waxed strong in spirit’ back at home in Nazareth. Both accounts were written over 60 years after the events, and by men, so there is no mention of the things women might be interested in. How long was the labour? Did it start while they were travelling the 80 miles from Nazareth to Bethlehem? The journey would have taken them at least four days on foot. As a carpenter, Joseph could well have owned a donkey for carrying his tools and timber. 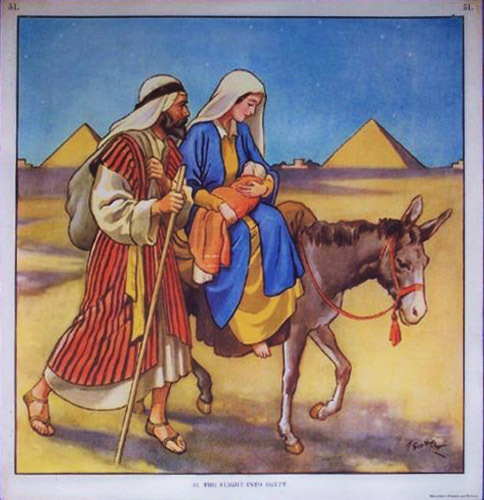 Christmas cards often depict Mary on a donkey out of sympathy for her predicament as a full-term primigravida, though she might have walked all the way. As Joseph came originally from Bethlehem, he probably had relatives living there. Joseph’s mother, sister or an aunt may have accompanied Mary through her labour, cut the umbilical cord and disposed of the placenta. Jesus was then ‘laid in a manger’ - a net or wooden box containing hay for cattle – a prickly place for a baby! 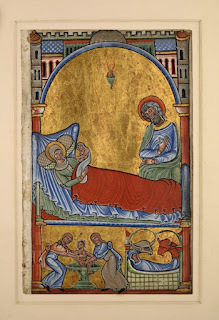 A manger (from the French word ‘to eat’) can be attached to a wall, a practical way of keeping a new-born baby safe from dogs and draughts while Mary was sleeping. 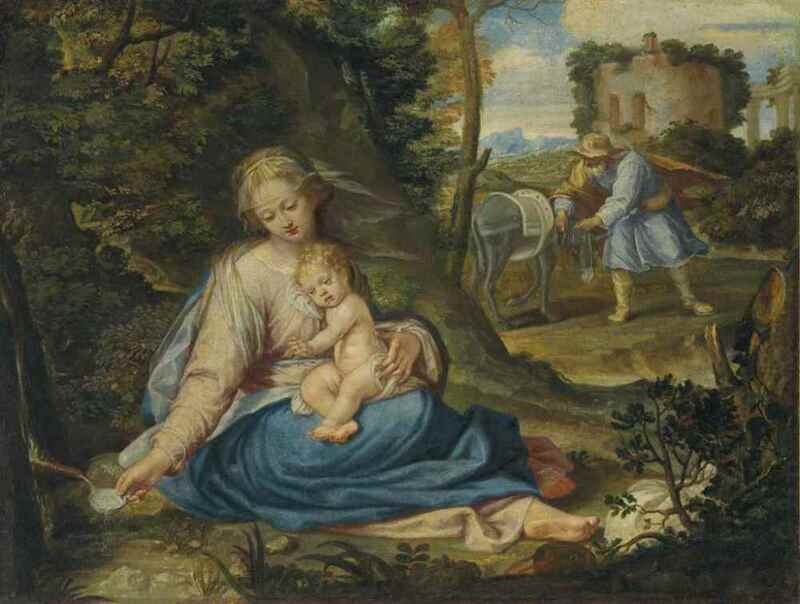 Bethlehem is at a high altitude and it could have been very cold, so Mary would have kept her new baby close to her body most of the time. We don’t know if they stayed in the stable for the 40 days Mary had to wait for her purification, a time of post-partum bleeding, or lochia. Hopefully, Joseph’s female relatives provided Mary with the necessary cloths which she then washed, and hung up to dry? 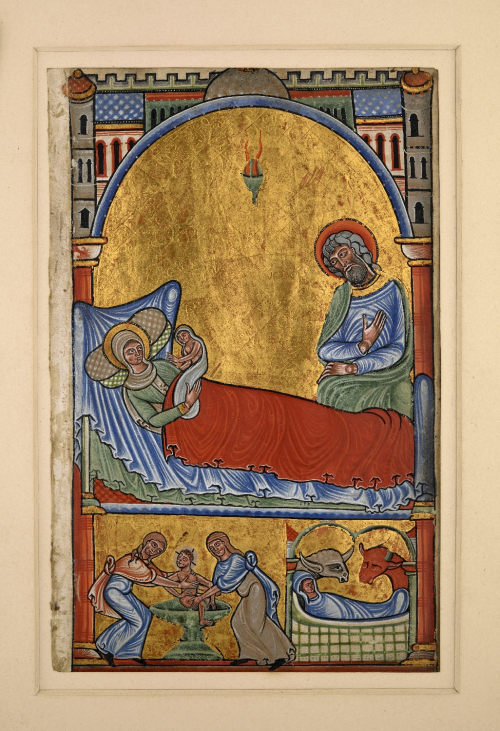 Matthew next tells of wise men from the East who visited the new baby, and warned his parents to return home by a different route, as King Herod wanted to kill the baby. Sometime after they returned to Nazareth, Joseph was warned in a dream to take the child to safety in Egypt. They left immediately by night, becoming refugees. Matthew’s account does not say when they had to flee to Egypt, but King Herod had ordered all boys under two years old to be slaughtered – indicating Jesus must have been about 20 months. Jesus was probably still being breastfed. They probably took the Via Maris – a well-trodden trade route along the coast of the Mediterranean Sea, that ran from Damascus to Memphis in Egypt. The journey from Nazareth to Abu Serghis, on the far side of the River Nile where tradition has it they settled, is about 500 miles. Google Map estimates this takes 150 hours to walk. So if the family kept up a pace of 8 hours a day, that would have taken them three weeks without breaks. Jesus would have been carried much of the way, breastfed every few hours; and Mary may well have had a menstrual period en route. Imagine her discomfort while walking or sitting on a donkey, with just cloth rags. There are many mediaeval and renaissance paintings of Mary breastfeeding Jesus. She is shown with a bounteous supply of milk and fullsome breasts, and Jesus is a well-fed chubby boy. 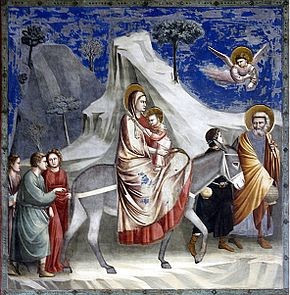 Giotto Bondone was one of many major artists who depicted the Flight from Egypt. 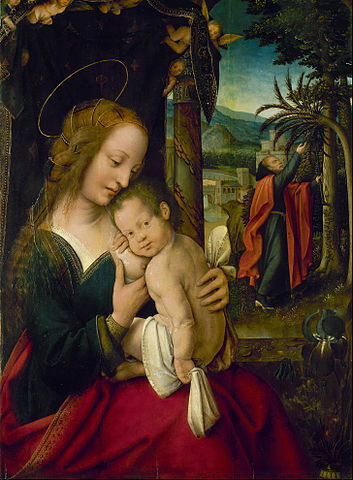 ‘The Rest on the Flight into Egypt’ became a common depiction in the life of Christ after the 14th century. As interest in landscape painting increased, the subject became even more popular and the figures were often shown in European scenery. The paintings are lovely but the conditions would have been much harsher in AD 2, with the risk of bandits as well as desert conditions of starvation, heat and cold. Until recently few historians have thought about how women dealt with menstruation in ordinary life, let alone as refugees, or women in the Bible. What was it really like? To recapture this experience, we can look at female refugees fleeing from war now. The testimony of the two women in this film, made in a refugee camp in Malawi two months ago, gives us an insight. Alphonsine and Pendeza are both Christians, but almost certainly unaware that their unintended journeys across Africa were similar to Mary’s 2000 years ago. I hope that they, like she was, are able to return to their homes one day soon. Illustrated Bibles of my childhood, as depicted by Scott Orr circa 1930. All quotes are from the King James Bible, published in English in 1611. France has a coastline of approximately 7330 kilometres. Much of it is magnificent and many of those kilometres are uninhabited, wild even. I am a sea baby. The old adage that being by the sea does you good, clears your lungs and regenerates your system is, in my opinion, true and the French have elevated the practice of ‘taking the waters’ to levels of excellence. They call it ‘thalassotherapy’. Thalassa from the Greek. Thalassa was the primeval spirit of the sea. 5th century Roman mosaic of the goddess Thalassa. Sea water therapy. Gallons of salty water, marine products and a coastal climate are the ingredients for the ‘cures’. Dotted along the French Mediterranean and Atlantic coastlines are establishments offering such cures. Here, they will cover you in seaweed and leave your body to soak up the minerals and recharge. Three days is minimum, five begins the beneficial effects, while seven to ten days will boost your constitution for the year ahead. We have just returned from a short pre-Christmas trip to the Camargue, which is a three-hour drive from our Olive Farm, direction west towards Barcelona. The Camargue is western Europe’s largest river delta (the Rhône and petit Rhône rivers) and is packed with a diverse choice of unique flora and fauna. It is my secret place. It is where I go to relax, walk and try to get a little fitter. I rarely if ever visit during the summer months because the area is packed with tourists and plagued by mosquitos. This time of year is perfect for me and this time my husband came with me. 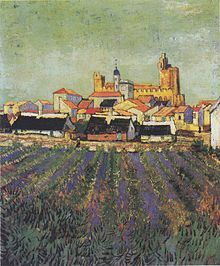 Vincent Van Gogh, View of Saintes-Maries de la Mer. 1888. We began our daily explorations with the Camarguais capital, the seaside town of Saintes-Maries-de-la-Mer, which I know well. 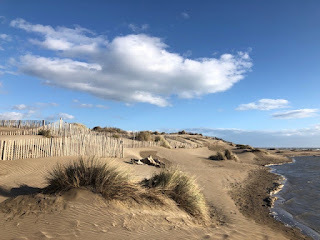 This is east Camargue, where the small town is surrounded by magnificent beaches abutting hectares of national parkland where wild white horses, black bulls and Europe’s finest and most varied display of wild birds feed and wade while paying the onlooker not the slightly bit of notice. I was rather taken aback on this visit to find that the municipality has paved its entire small town with concrete. Brutalist road planning gone mad. Everywhere was closed except for the medieval church, which was our point of interest. First, a little about the town's history and why a population of less than 3,000 can swell to half a million during the summer months and during the two Roma pilgrimage festivals, which take place in May (24th, 25th) and October. Aerial view of the church in Saintes-Maries-de-la-Mer. It can be seen in any direction from a distance of ten kilometres. This tiny fishing village was known to the Romans as Ra, as noted by the Roman geographer, Rufus Festus Avienus. In Celtic times, it was already a holy place, a sacred site, known as Oppidum Priscum Ra. After the crucifixion of Christ when all Christians in the Middle East were threatened with death by the Romans unless they renounced their allegiance to Christ many fled the territory. Legend has it that in 45 AD a small boat transporting four women and possibly two men man was washed up, after a perilous journey, on the Camarguais coast not far from Ra. The local fishermen and their families welcomed and assisted the strangers. Three of the rescued women bore the same name: Mary. Mary Salome, Mary Jacob and Mary Magdalene. The fourth woman, who may or may not have been aboard the boat - there are several differing stories about the identity of this woman - was a dark-skinned servant either from Egypt or Ethiopia. She was called Sara. The men are identified as Lazarus and Joseph of Arimathea. The women began to preach the word of Christ. Christianity had arrived in France. The faith spread fast and the women were revered. 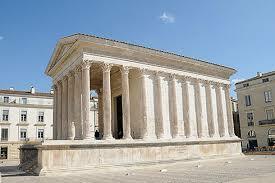 In the 6th century a bishop from Arles built a church-monastery on the plot where the present Romansque church stands. The town including the site where the adrift boat had landed was renamed Nôtre-Dame-de-Ratis. (Our Lady of the Boat). 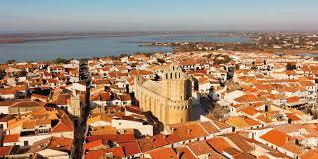 It was later changed to Nôtre-Dame-de-la-Mer and finally, in 1838, to Saintes-Maries-de-la-Mer. 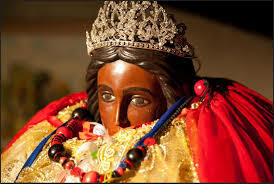 Saint Sara, also known as Sara-la-Kali, or Sarah the Black, is the patron saint of the Roma people, the Gypsies. She is the patron saint of travellers. Her statue of her resides in the crypt of the church. It is always surrounded by lit candles. Twice a year the small town is the final destination for a Roma pilgrimage. In late May and October. I have been to Saintes-Maries-de-le-Mer once during their pilgrimage festivities when the streets ring out with the clop clop of horse hooves and, in the evenings, with evocative guitar music. It is an extraordinary spectacle to witness. A reliquary containing the bones of the Marys is borne from the church by men on horseback. These are local gardiens, keepers of the Camarguais horses. They are followed by costumed Gypsies carrying the statue of Sara. The entire procession, along with throngs of tourists and onlookers, makes it way to the sea. There in the water a priest blesses all the saints and the attendants too. 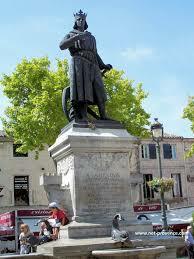 I have also during one of these visits attended a mass celebrated in the church in the local Provençal language. 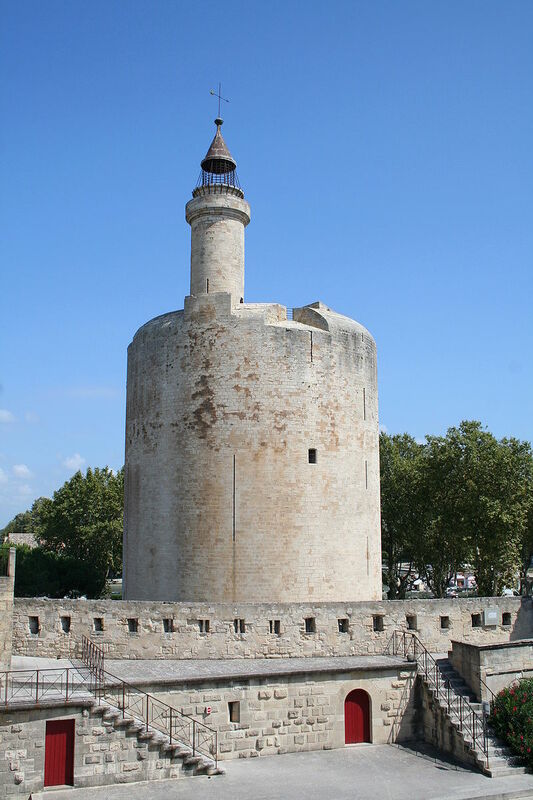 About ten miles inland of Saintes-Maries-de-la-Mer, off the RD 570, the road to Arles, lies sixty hectares of inspiring bird sanctuary, the Parc Ornithologique de Pond de Gau. (It is a terrific outing for children). It offers two circuits: short or long. We opted for the longer, the seven-kilometre trail through marshes and riverbank pathways. An ambitious choice for a pair who had spent the morning being pummelled with salt-water and caked in heated seaweed paste, but on we went plunging ourselves into the network of islands, marshlands and water. The first three lagoons were teeming with rose-pink flamingoes. The symbol of the Camargue, and the only place in France where they breed. Here, too, owls can be spotted, also otters glsitening in the sun and paddling in the wetlands (we caught sight of two); eagles, harriers, white herons, egrets, storks, waders of every description – the list is impressive. Within the park there is also a clinic, a sanctuary of several cages, where birds damaged in the wilderness, are nursed back to health. These can be observed at close range. Happy, tired and at peace with the world, we returned slowly to our hotel in the Languedoc quarter of the Camargue, south of Montpelier and Nîmes. Sunset was falling. A vermillion sky with flocks of white herons flying overhead; all reflected in the salt pans and swamplands. A burning landscape. The following morning we were up and out of bed as the sun rose, spilling a delicate salmon-pink over the water. We set off for the beach, walking inches from the waves where the sand was damper, darker, and we skipped and jumped in the foam. The beach was deserted. Silence save for the mew of gulls, the crunch of washed-up, empty mussel shells beneath our feet and the deep-throated horns from the fishing boats delivering their catch to the shores, followed by a vaporous grey trail of hungry, squawking birds. We were standing on the rim of the Gulf of Lion, a wide Mediterranean embayment. Seven rivers empty into this generous mass of water. The beaches run from northern Catalonia to Toulon. Much of this coastline is made up of salt marshes and lagoons. Looking out to sea on a calm warm winter’s morning such as this one, it might have been one giant pond spreading as far as the horizon. Later, we drove to Nîmes, a city that boasts one of the best preserved Roman temples in what was once the ancient Roman world, La Maison Carrée. The city is still trying to gain UNESCO heritage status for this very well-preserved building. Les Arènes de Nîmes, an amphitheatre and a contemporary of the Colosseum in Rome (built around 70 A.D) is today used for rock concerts and two high-profile annual bullfights. We were the lone spectators contemplating a vast empty stage. It was the first time I had ever wanted to be present at a bullfight, if only to see this immense place pulsating with danger and excitement. Afterwards, we strolled to the Place du Marché to the Patisserie Courtois – in English, the Courteous Cakeshop - and indulged in a large and very creamy hot chocolate. This was hot chocolate like you rarely find it today. This ‘café historique’, founded in 1850, was also serving miniature home-made panetonnes and I could not resist the temptation. While we sat in this old-fashioned cafe wondering whether such calorific goodies were allowed whilst taking a ‘cure’, we tuned in to the quartet of customers alongside us who were locals reminiscing, sharing their experiences of ‘la guerre’ and those of their parents from the Great War before them. Fascinating to hear their conversation, which included the fact that much of the south was part of the Free Zone of France during World War II. Their accents were as thick as the hot chocolate. Our return journey to the hotel found us beneath yet another cinematic, carmine-red sky. Ahead, a vast golden globe was sinking out of sight beyond the bullrush marshes. There were flocks and flocks of birds overhead including the pink and black flamingoes. It had been the best of days. We made several visits to the small walled city of Aigues-Mortes, once upon a time an important port. Within its ramparts are many restaurants and tourist shops. Most were closed during our stay. 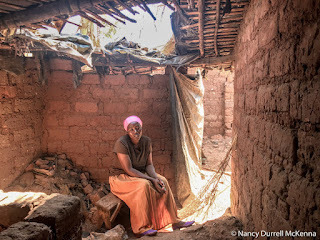 There is a small population, close to 1,500, who live intra muros, within the walls, but most of these are foreigners who use the houses as second residences. The body of the population live outside the old city. In the past I have walked the ramparts but this time it was not possible. The views from on high are wonderful across the flat saline marshes where the only elevations are the mighty mounds of harvested salt. In the city's central square stands an impressive statue of Louis IX who was King of France from 1226 until his death in 1270. He succeeded to the throne when he was twelve years old. He twice led his soldiers to the Crusades. Neither outing was a great success. The first time he was captured and it cost a mighty ransom to secure his release. On the second occasion, soon after landing in Tunis, he was struck with typhoid fever and died. He was well loved, did a great deal to unify France and was later, in 1297, canonised Saint Louis. His feast day is 25th August. On our last Camarguais evening, the hotel restaurant served their Sunday special: seafood platter. It would have satisfied a hungry shark. Half a crab, six small langoustines, whelks and various other small shell creatures I did not recognise. It also contained six large Bouzique oysters. An interesting fact told to us by the waiter: their high zinc content aids the production of testosterone, which might explain why they have long been considered an aphrodisiac. The French are Europe’s leaders in l’ostréiculture – oyster cultivation. They also consume with immense gusto over ninety percent of all they produce. Fitting for our thalasso experience, the Bouziques (a Mediterranean variety) were presented on a hillock of seaweed with wedges of lemon and a small dish of shallot vinegar to accompany them. We were served a fine glass of Languedoc red to wash them down. Nectar, after a dry week. The following morning before crossing the leg of France that unites the country to Spain, we made a stop in the neighbouring fishing village of Le Grau-du-Roi. Its tiny heart remains attractive but the rest is overrun with holiday lets. We found a store close to the canal where we purchased two cases of local, rather underrated and reasonably priced Languedoc red wines, one of Corbières and one of Fitou. Grau is an unusual word. Its root is in the Occitan language and it roughly translates as bayou. We drove through acres of stark, winter vineyards with distant views to a glimmering sea. Many of these wineries were originally planted up by the Romans, but it has only been within the last quarter of a century that France has recognised the quality of these southern wines. It was a glorious morning. The winding roads were deserted, save for a couple of tractors. We took our time, moseying along B routes, catching sight of small huddles of Filets Jaunts at roundabouts who waved as we passed by. I was sorry to leave this region with its fascinating Moorish and Cathar history, (which we hadn't had time to investigate), its magnificent coastline, its Roman heritage. As we endure our national nervous breakdown it’s interesting to be shown by this wonderful exhibition at the British Library just how international this country was during the six centuries between the departure of the Romans and the Norman conquest. 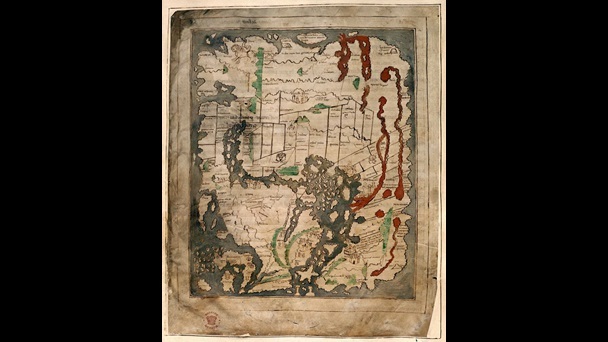 This Mappa Mundi was probably created at Canterbury in the 11th century, but is thought to be based on a Roman map. 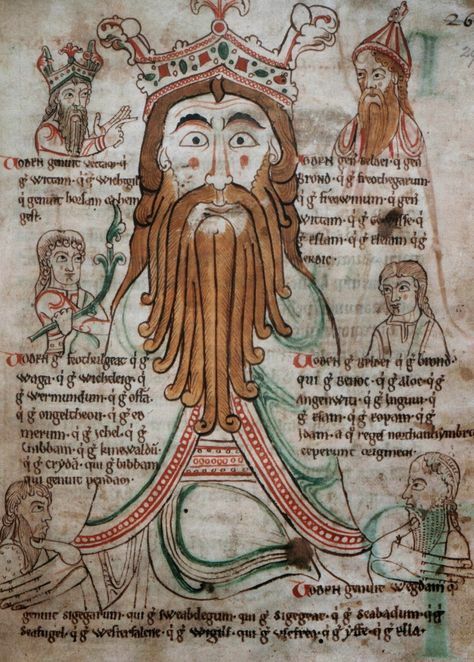 It’s the earliest known depiction of the British Isles ( in the bottom left hand corner). Two fighting figures may represent the conflict between the Saxons and native Britons that raged in the centuries after the Romans left. The language we all attempt to use might easily have been very different. Latin continued to be the language of the most educated and English evolved from West Germanic dialects spoken by the Angles, Saxons, Jutes and other Teutonic tribes who invaded England in the fifth and sixth centuries. They brought their gods as well as their languages, as can be see by this painting here of a crazed looking Woden, king of the gods ( the German Wotan and the Viking Odin). I always find the British Library an exciting building, a temple to the book with its central spine made up of George 111’s library. 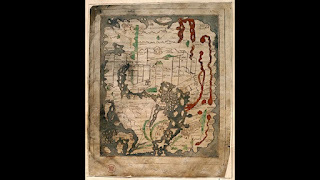 This exhibition reminds us that after these islands converted to Christianity books of stunning complexity and beauty were handmade and illuminated by monks in scriptoriums and then circulated around Europe. 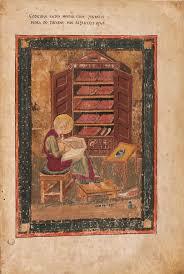 Many of the artists and craftsmen who worked on these manuscripts moved freely from country to country. In 716 Ceolfrith, abbot of Wearmouth-Jarrow, set off from Northumbria for Rome carrying an enormous, richly illuminated bible as a gift for the shrine of St Peter. The monks sang and wept as his boat set sail and their fears were justified, for Ceolfrith died on the voyage. The bible ended up in the monastery of Monte Amiata in Tuscany, which is why it is known as the Codex Amiatinus. The oldest surviving complete Bible in Latin it has now returned to Britain after 1300 years. Here is the prophet Ezra writing with his feet on a stool, an inkwell on the desk in front of him and a drawing compass on the floor. Despite his dinner plate halo he looks contented, it’s a timeless vision of the joy of writing. Behind him nine manuscripts lie flat on the shelves of a cupboard, waiting to be read. The St Augustine Gospels, which came to Britain with a Christian mission in the sixth century, are richly illustrated with classical columns and arches. The memory of grand imperial buildings must have outlived the empire. This sophisticated Latin culture was threatened by Viking raids from the eighth century. 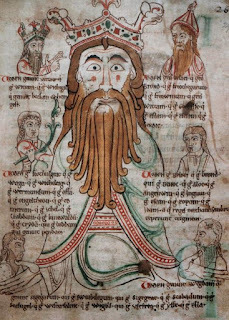 King Alfred the Great personally translated Pope Gregory the Great’s Regula Pastoralis into Old English so that people who didn’t know Latin could read it or have it read to them. 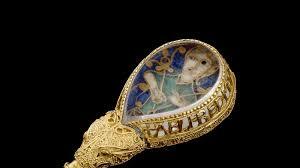 The king gave away sixty free copies with a jewelled reading pointer made of ivory. 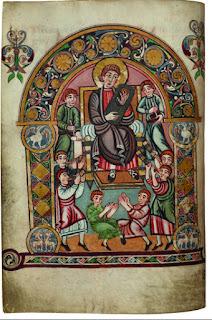 Other treasures include the beautifully illuminated Lindisfarne Gospels, the earliest surviving text of the poem Beowulf with its Scandinavian hero and Bede's Ecclesiastical History. The greatest Anglo-Saxon intellectual, the Northumbrian Venerable Bede, points out in one manuscript that the Earth is undoubtedly a sphere, “like a ball”. Here he is, writing away. Some of the more obscure exhibits are fascinating too because they show how arbitrary survival is; for instance, a tombstone carved with runes that turned up a thousand years later, having been used as a mangle stone in a cottage. Canterbury was a great centre of learning centuries before Oxford and Cambridge were founded. An important school was established there in the seventh century by Archbishop Theodore, who came from Tarsus in Asia Minor, and Hadrian, an abbot from North Africa. Among the subjects taught at this school were poetry, astronomy, mathematics and Greek. One of the manuscripts made in Kent was the Vespasian Psalter, an illuminated copy of the Book of the Psalms. With its gold and rich colours, the script and decorations show the influence of Roman models, indicating that Kentish culture was both wealthy and shaped by links to the wider world. At the end of this glorious exhibition is the Domesday Book, lent by The National Archives. Commissioned by William the Conqueror in 1085, nineteen years after his Norman forces defeated King Harold at the Battle of Hastings, it is a sobering reminder that this was the most detailed survey of how and where people lived in England, and how much they were worth, until the first census in 1801. Contemporaries knew that this vast survey was an extraordinary achievement. Richard Fitz Nigel, the royal treasurer, reported that the English called the book Domesdei, the Day of Judgement, because its decisions, like those of the Last Judgement, could not be appealed. This amazing exhibition finishes on February 19th. Many thanks to the British Library for giving me permission to reproduce these images from their website. With this illumination of the nativity I wish you all a very Happy Christmas. 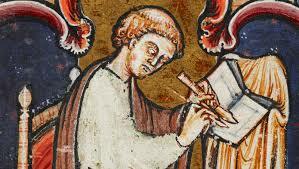 Writing about the medieval period, I am always fascinated by the illustrations and depictions. I thoroughly enjoy studying them to glean the small details of daily life. To me, it's a bit like the original Mary Poppins film where Mary and the children leap into one of Bert's chalk pictures and go and have an adventure further into the picture where there are stories within stories and all manner of colourful details to delight the eye. If reading sources begins to tire me and I can feel my concentration slipping, then a browse through sundry manuscript illustrations is often just the ticket. Some might call it procrastination, but I prefer to regard it as a research enhancer. I am eternally grateful to live in the digital age when so many institutions are making their collections available online. I have become the fortunate recipient of a wide world of material that I could never have imagined being available at the outset of my writing career. For my next project, I am moving up to the thirteenth century from the twelfth and I have been jumping into a vibrant world of discovery. I also collect pictures of hats, so the chap in the background is of interest too! Trinity College, Cambridge, has a trove of medieval manuscripts online, including one known as the Romance of Alexander. Written in Old French in circa 1250, possibly at St Albans, it includes 152 illustrations of Medieval courtly life. I was fascinated to see this one of a bishop disrobing. He is wearing loose medieval 'underpants' generally known as braies. They would have been made from linen. It is so interesting to see that they are rolled over at the top and a belt threaded through to hold them up. Not only that, but his purse is firmly attached to his underwear at the sides. Medieval clothing in the 1250's did not have pockets and to get at the purse, the gown had to be lifted, as displayed on this 13th century Life of St. Edmund. The next evolution was to have slits in the side of the gown in order to reach the pocket, and eventually pockets themselves begin to be attached to the outer wear rather than underclothing, but post Medieval in context. The pocket scene is one minor example. I trawl illustrations and collect all manner of themes and subjects - underwear being one of them. The above braies have entered that particular collection board. I have another that studies cloaks and cloak fastenings and in which it has become obvious that no medieval woman ever pins her cloak high on the shoulder. It's a masculine thing. I have collections of bedding and pillows (watch out for those laced pillow cases and also for check-patterns). are all over the place! I collect depictions of dogs and horses, cups and table cloths, floor coverings, beds, hats, belts, hose, shoes, cooking pots, you name it. I pluck the images from the illustrations, I study their facets, and use them both to further my knowledge and to build a world within my own chalk picture. Trinity Colleges's collection of manuscripts. And the Web Gallery of Art - among many others. At the height of his fame, John Clare, the nineteenth century peasant poet enjoyed receiving Christmas gifts that he could never have dreamed of as a Northamptonshire pot-boy, lime-burner or ploughman. Silk neckerchiefs, eau-de-cologne and gold-tooled books arrived as presents from publishers and patrons: unaccustomed luxuries for a man more used to working in the fields to feed a large family, crammed into a tiny labourer’s cottage. The contrast between past poverty and relative wealth was nowhere as sharply demonstrated as through the replacement of his battered old fiddle with a faultless, polished Cremona violin. Clare stood astride two worlds. In London, for a time, he was feted in literary circles, wined and dined. But returning to his native village, promised patronage was often late or forgotten and he had to return to manual work in order to keep food on the table. His literary fame became a burden at home. He felt increasingly isolated from his fellow villagers whom he feared saw him as filled with ‘airs and graces’. Sometimes he was called home from the fields to meet a visitor: a genteel fan in search of a literary chat who gave never a thought to the fact that leaving his post would cost him his whole afternoon’s wages. The strain of trying to live in these two very different worlds, whilst fitting into neither, began to tell and may have contributed to his growing mental frailty. In later life , he became prone to delusions, sometimes believing he was Byron, Admiral Nelson or, alarmingly, the boxer Jack Randall. He also came to believe that he had two wives” his real wife Patty and his childhood sweetheart, Mary Joyce. This odd dilemma for Patty was the inspiration for my novel ‘The Poet’s Wife’ , in which Patty tried to fight John’s demons and get back the man she married. John Clare’s obsession with his childhood sweetheart is in a way unsurprising in a man who clung to the past. His personal past was precious to him and he writes of the freedom of his boyhood collecting birds’ eggs and pooty shells (snails), and once wandering so far across the heath that he thought he could come to the edge of the world. He also treasured a common past: the seasonal rhythms of farming life and the traditions of a rural community. 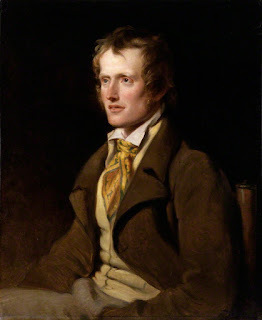 He records in his poem, ‘The Shepherd’s Calendar’, the traditional entertainments of Christmas: the wassail singer, the Mummers’ play and how ‘harlequin, a laugh to raise/ Wears his hump back and tinkling bell.’ Just as the enclosure of common land had deprived him of his freedom to roam, he feared that as farming became mechanised and labour migrated to the cities treasured traditions would fall away. He writes, with great affection, of a country Christmas, of a bright hearth and a sanded floor, of yew, holly and ‘mizzletoe’ decking candles and pictures - greenery brought indoors as a symbol of eternity. 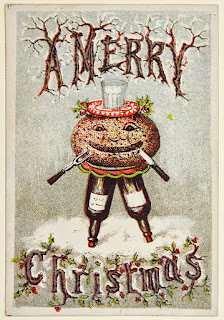 He lingers with relish on ‘boiling eldern-berry wine’, pudding wrapped in muslin, sage-stuffed sausage drying in the chimney nook and sugar plums. Once when I was giving a talk on ‘The Poet’s Wife’ I was afterwards treated to a plate of sugar plums, in celebration of a Christmas scene in the novel. In rural Northamptonshire it e=seems that some of Clare’s beloved traditions still linger. Long may they last. of Christmas that turns me into the Grinch. I'm down to sending a handful now and, in that at least, it seems I'm on trend. Large companies like Hallmark have seen the amount of Christmas cards purchased each year decrease by a third since 2007 and the drop isn't just in the UK: research from the American Greeting Card Association suggest that Europeans and Canadians now send an average of 11 cards per household per year compared to the staggering 300 posted out by pre-baby boomer families, while Americans (despite the best stationary shops on the planet) only send 8. The tradition of sending cards goes back to the mid nineteenth century. Producing the first commercial Christmas card is an honour claimed by Sir Henry Cole in 1843 but it was a German immigrant to the USA who started the greetings card industry as we now know it. 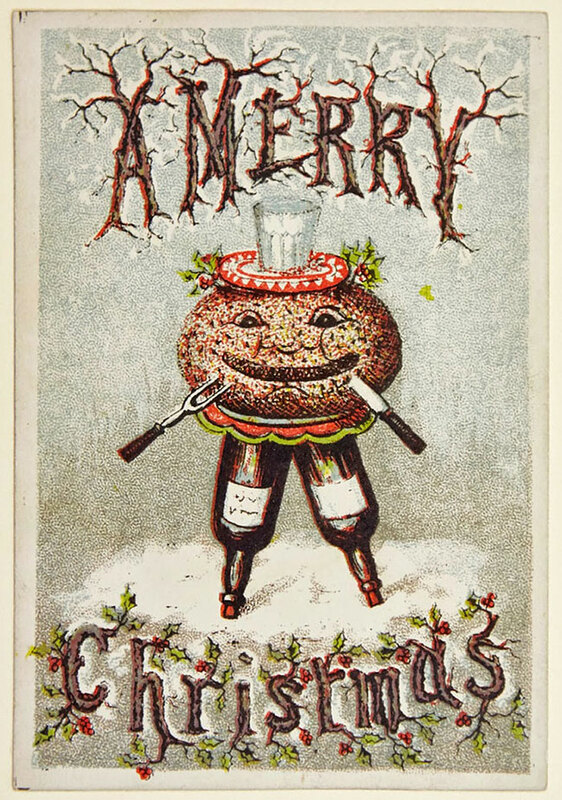 In 1856 Louis Prang opened a small lithographic business near Boston, by 1866, he had perfected the colour lithographic process and by the 1870s he was publishing a range of deluxe Christmas cards. 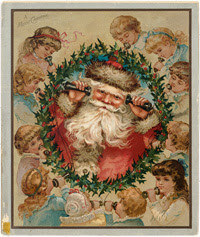 These were mainly sold in England where the introduction of the halfpenny stamp had made sending cards affordable across a wide range of society but the habit also gained ground in America with Prang's cards taking such a big share of the market (he was printing 5 million cards a year by 1881) that he became known as the father of the American Christmas card. 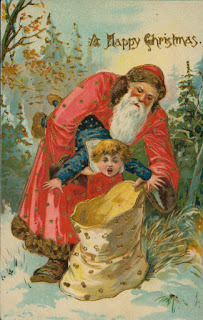 This seasonal success story then takes on more of an It's A Wonderful Life feel: Prang's cards were lavish and expensive to produce, often with 30 colours on one print plus glitter (and occasionally tassels) and he was eventually forced out of business in 1890 as cheap copies flooded the market. His cards are now highly collectible - although not quite as valuable as the first Cole card which sold at auction in 2001 for $35,800. That's one I would have made a bit of space for. Children riding bats anyone? Beetles dancing with frogs, mice riding lobsters? Children being menaced by snowmen even Stephen King couldn't dream up? The iconography of Christmas - trees, puddings, the jolly old Santa - is there in nineteenth century cards but there are also a host of other influences, from the Germanic Krampus and 'monsters of nightmareland' as Gleeson White (editor of The Studio) called some of the images in 1894, to natural history (a Victorian obsession) and what some historians have catalogued as social messages: dead robins in the snow as reminders of the starving poor. Whatever the reasoning was behind the macabre designs has been lost in the passage of time and it may be that these cards were the oddities not the commonplace - the fact of their collection giving them perhaps more importance now than they had at the time. 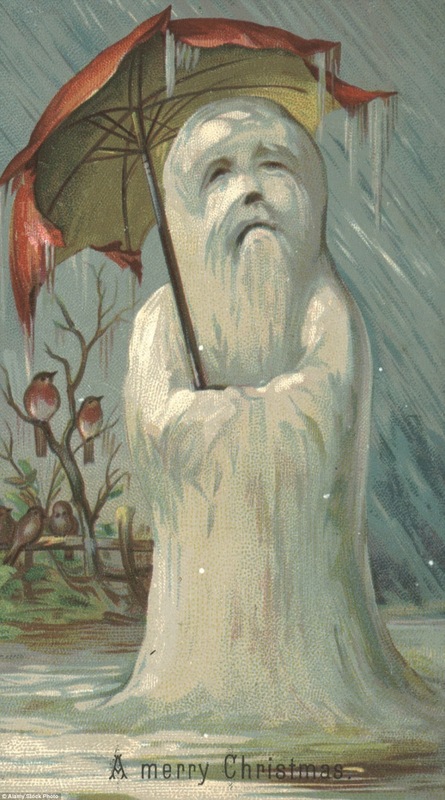 Today the most popular card sold features three cutesy cherubic angels, including one with eyes that would sit better on a spaniel. Since Hallmark first produced it in 1977, this image has sold 34 million copies. Do not send me it. These, on the other hand, would take pride of place. Enjoy and Merry Christmas one and all. Have you ever thrown a vase? Not in anger but on a potter’s wheel? 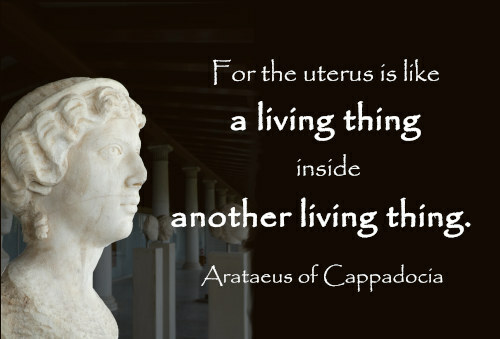 One of my protagonists in the Tales of Ancient Rome saga does both. In imagining her story, I realised I had a problem - I could always experience smashing a plate, but I had no idea how to fashion ceramics. 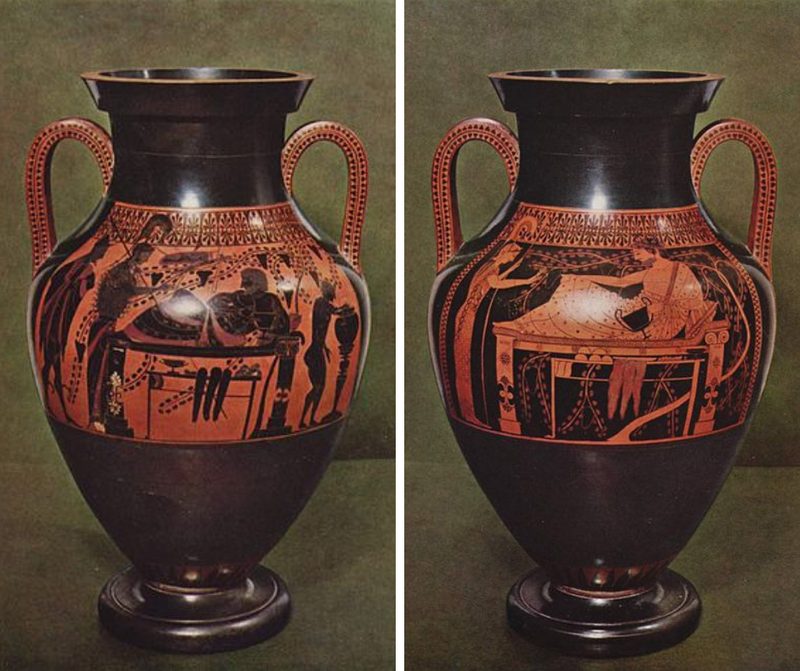 Once I started researching, I found myself delving deeper into the methods used in Greece and Etruria to produce both mundane and exquisite pottery. The earliest means of producing ceramics was by working clay by hand through either coiling strips or pinching a hollow to form a vessel. The poorer classes would have made their own pots in this way until cheap earthenware was mass produced by using moulds. The potter’s wheel was believed to have been introduced in Mesopotamia in 6000 BCE and was quickly adopted throughout the ancient world. By the Classical age (C5th BCE), the invention consisted of a turning platform about a metre above the floor connected by a long axle with a heavy flywheel at ground level. This was kept rotating by kicking the fly wheel with the foot which left both hands free to shape the clay. The mechanics of throwing a pot was not all I learned. There was chemistry, too. Etruscans were famous for their thin-walled, glossy black pottery known as ‘bucchero’ which could be decorated with elaborate designs applied to the semi-hard clay using stamps. The black colour of bucchero was achieved by ‘reduction’ i.e. establishing a very high temperature within the kiln then closing the vents to reduce the oxygen rather than the heat. When the atmosphere was charged with carbon monoxide, the red of the clay converted to black due the presence of iron oxide. Indeed, the clay of the Etruscan regions of Italy was rich in iron which helped this process. The Etruscans were famous for high quality bucchero ware and terracotta sculptures which were exported throughout the Mediterranean. They were also enormously fond of Attic vases. Some Etruscan grave sites were riddled with thousands of vessels depicting mythological tales in beautiful tracery upon either a black or red background. 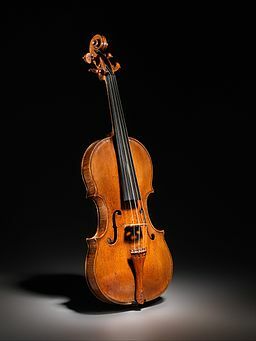 Many were imported from Greece or created by Etruscan craftsmen who were heavily influenced by Greek immigrant artisans. 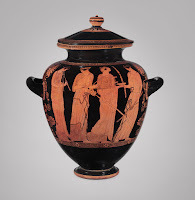 There were two Attic vase techniques: the black figure Corinthian method originating in the C7th BCE followed by the more sophisticated red figure Athenian style. Potters who created black figure vases painted characters in black silhouette on the surface using a liquid known as ‘slip’. Fine lines were incised into the surface to provide contour and detail. White paint was applied to represent women’s skin. Both white and red were used to highlight details such clothing, hair or weapons. The pots were then subjected to a complicated three-phase firing process which involved varying the temperatures within the kiln at different stages to effectively apply the oxidisation process. This generated the red colour of the underlying surface, and the glossy black of the figures who were always shown in profile. Over time the Etruscans moved away from the Corinthian style to use the ‘pseudo red figure’ technique that involved painting the clay black before adding red silhouettes and scratching lines to achieve definition. They also produced their own distinctive pottery style with figures painted red on white. 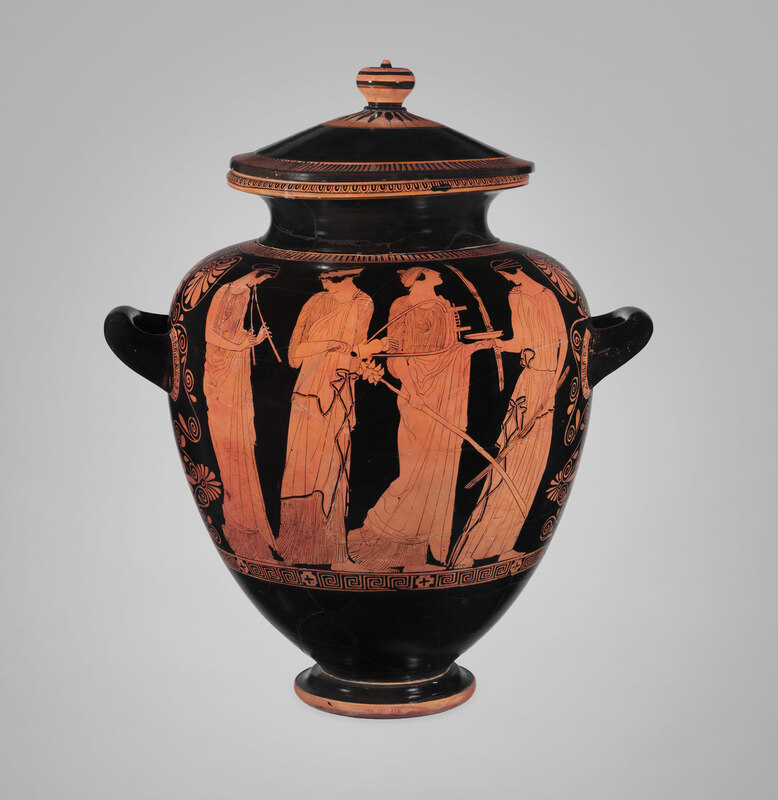 In contrast, ‘true’ red figure vases were produced by applying a technique first used in Athens around 530 BCE. Here, the figures were created in the original red-orange of the clay using a fine brush. This allowed for greater detail because lines could be drawn rather than incised. As a result, the painted scenes were more detailed and realistic. It also allowed artists the opportunity to work with greater perspective by depicting front, back and three-quarter views, therefore producing a three dimensional effect. Black and red figure painting gave rise to a number of identifiable potters and artists. Some are known by their actual names due to the fact they engraved their signatures on the bottom of the pots e.g. Exekias. Others remain anonymous but their styles are clearly identifiable resulting in historians attributing them with soubriquets e.g. the 'Andokides Painter'. Exekias was a potter and painter who lived in Athens between approximately 545-530 BCE. He is considered one of the greatest Attic vase painters, specialising in black figure ceramics. He was innovative, experimenting with new shapes and painting techniques. Fourteen signed works by Exekias survive with many others identified due to his stylistic method. The signatures vary from ‘Exekias made me’ to ‘Exekias made and painted me’ which has given rise to a theory he only acknowledged decorating those pieces of which he was particularly proud. One of Exekias’ most famous works is the so-called ‘Dionysus Cup’, which I saw in the Munich Antikensammlung in 2016. It depicts the tale of the pirates who attacked the wine-god on a sea journey to Athens. Dionysus caused vines to entwine the mast, causing his frightened assailants to dive overboard, whereupon they were transformed into dolphins. Instead of portraying the deity at the height of the conflict with his kidnappers, Exekias shows Dionysus reclining at a feast with the dolphins cavorting around him. The scene exudes a sense of peacefulness and poetry. Exekias has given the ‘wine coloured’ sea a vivid coral red shade by using a special clay slip that turned bright red when fired. This was the first time the technique was introduced. In Attic times, his composition was revolutionary. Today the cup is one of the most famous Greek vases. The Andokides Painter is believed to be a pupil of Exekias. He is also considered to be the ‘inventor’ of the red figure method. His style has been attributed to various pieces even though most remained unsigned. Academics have dubbed him the ‘Andokides Painter’ based on the signature ‘Andokides’ that appeared on 16 pieces within the collection. One of the most famous vases signed by Andokides is the Herakles bilingual amphora found in the Etruscan city of Vulci. Bilingual vases are important evidence of the transition between red and black figure techniques. They depict the same subject in the two different styles on opposite sides of one vessel. 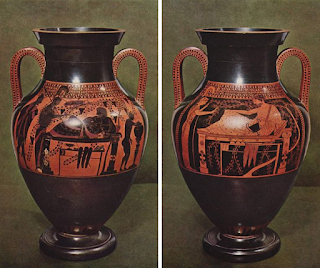 There is debate as to whether both sides of the Herakles Amphora were painted by the one painter or whether the black figured side was rendered by the Lysippides Painter, another student of Exekias. No matter what Attic technique is used, I never fail to be delighted by the scenes and characters depicted upon the surfaces of plates, cups, jugs and vases: a mythological narrative about gods, mortals and monsters locked forever within kiln hardened clay. 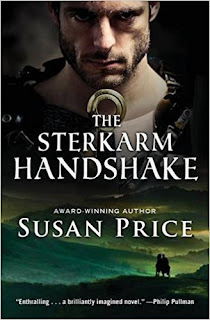 Elisabeth Storrs is the author of the Tales of Ancient Rome saga. Learn more at www.elisabethstorrs.com More examples of Attic vases can be found on her Pinterest board. Images are courtesy of The Met Project,Wikimedia Commons and my holiday snaps!